A doctor lost her life earlier at a behavioral health center in Dallas, Texas earlier this month after being tackled by one of her patients. The hospital had been in the process of relocating some of their patients due to some “safety woes.” A patient was upset to learn of his own impending relocation, leading him to assault a doctor who happened to be standing outside of his door. The collision brought the doctor to the floor, where she hit her head and immediately lost consciousness and eventually passed away. 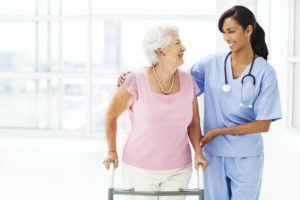 Unfortunately, it’s a common misconception in the healthcare and social service community that assaults are part of the job, especially in behavioral health centers and nursing homes where patients are often disoriented and confused. In fact, half of all nonfatal but serious injuries occurring in the workplace happen in healthcare and social service settings. Not only is this statistic estimated to be much lower than the true number of healthcare staff attacks, as many assaults go unreported, some assaults do actually end in mortalities. Now more than ever, hospital executives are faced with the question, how can we ensure that our personnel are safe without infringing on a comforting patient experience? Feeling safe doesn’t just improve moral, it ensures that hospital personnel aren’t distracted by the stress of their personal safety, improving overall patient experience and staff satisfaction. While hiring more security guards may seem like the obvious answer to safety concerns, too many security guards walking around can give patients the feeling that they are constantly being watched, as if in prison. This only contributes to patient confusion— the very cause of these potentially dangerous situations. Furthermore, it can be quite difficult for a security guard to know exactly when a threatening situation is occurring, especially because it doesn’t take long for a threat to escalate to a full-scale assault. In order to truly protect staff members, healthcare facilities need to implement a solution that can alert others to help the moment a situation spirals out of control. The best solution to ensure the safety and well-being of healthcare personnel is to implement an automated staff duress and panic alerting system. This type of wireless security solution protects healthcare personnel by enabling immediate response times during emergencies by instantly locating the specific employee under duress. With either a wall-mounted device or a small staff badge that can easily be hidden behind an employee ID badge, a nurse or doctor could discretely summon help if faced with a threatening situation or is in need of assistance. To learn more about clinical-grade staff duress and panic alerting solutions and how they can help protect healthcare staff members against threatening and dangerous situations, download the CenTrak Staff Duress Overview.